There are two dedicated function rooms, both of which lead out to a beautiful outdoor area that overlooks the farm dam. The courtyard makes for an outdoor reception area or for a relaxing breakaway and the dedicated conferencing kitchen offers predesigned menus at variously priced, but flexible options. 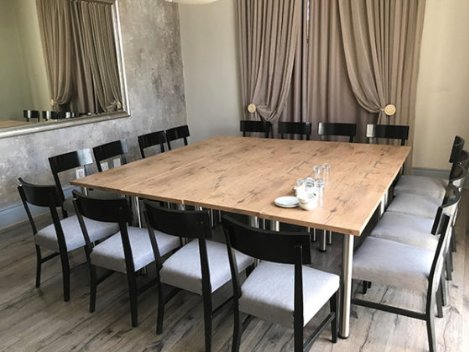 The Sage Room is perfect for private VIP dinners seating up to 16 guests and can be set up in numerous configurations for board meetings or strategic sessions with your team. We focus on professional, five-star hospitality. The Saffron Room seats 120 cinema style, 80 banqueting and 60 boardroom style. 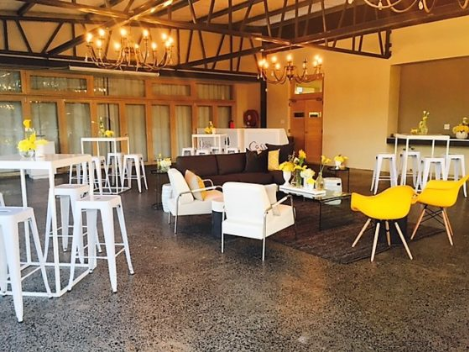 The combination of the two halls creates sufficient space to seat 200 guests banquetting style or 300 cocktail style, allowing for stunning views of the Durbanville wine valley with the backdrop of the magnificent Drakenstein Mountains. Whatever your needs from teambuilding, strategic sessions, board meetings, our professional team can custom design a wonderful event with you. Data Projectors, Screens & Flipcharts and any additional AV equipment required for the Glass Conservatory. Other more specific equipment can also be organised – prices and equipment lists are available on request.